Hasselback apples topped with walnuts, oats and Nektar honey crystals make for a delicious healthy baked apple dessert. Gluten Free and Dairy Free. Ready in 30 minutes. Hasselback apples made with just 6 ingredients – the perfect dessert for anyone who loves apples! The only apples I love are green apples. Red, multi color – all tooo sweet for me. The green ones are perfect. Juicy, a bit sour and not too sweet. Light and crunchy just how I like it. Something about winter though – not the raw apple eating season for me. Hasselback apples though – that’s a whole other story. Those I’m down with. Even more so when they’re shaped to resemble hasselback potatoes — whhhattt – I know, cool right? And better yet when they’re sprinkled with a crumble made of pulsed walnuts, gluten free oats and Nektar honey crystals. Now this hasselback apples recipe is a dessert for a cold winter evening. You can always just leave the apple halves intact, or just layer them in thin slices on the baking sheet, but I kind of loved making thin slits almost to the bottom and then stuffing the lightly sweet and nutty crumble mix right in between the wedges. And all over the top and the sides of the baking pan of course. The crispier it got in the oven the better. This hasselback apples recipe can be completed in 30 minutes flat. Twenty to twenty-five of baking time and just a few minutes required for prep. My apples were fairly small so if you are using larger ones adjust the baking time accordingly. 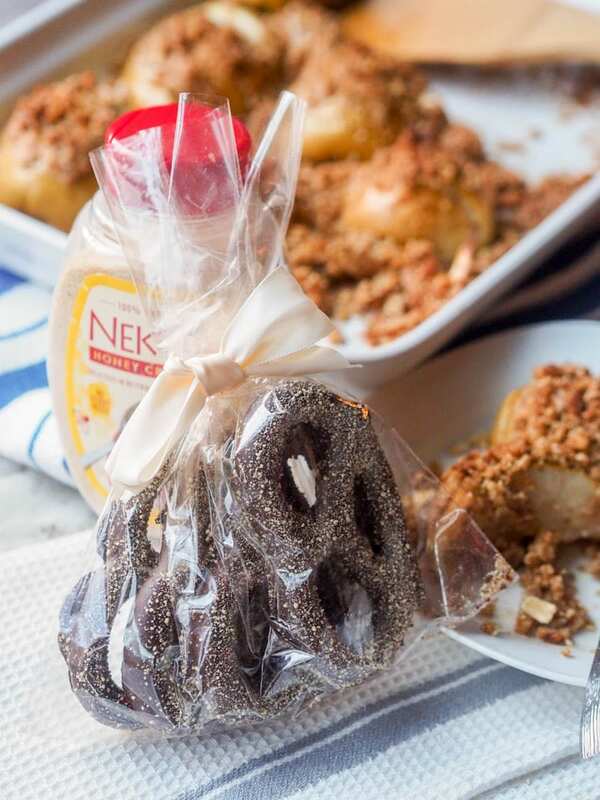 In terms of serving you can eat these healthy baked apples as is, add a dollop of coconut whipped cream, or simply serve alongside these dark chocolate covered Nektar dusted pretzels. Kind of a perfect pairing for a nice Valentine’s day dessert if you ask me. You’ve got the soft nutty caramelized apples and then those crispy crunchy salty chocateley pretzels. Kind of all the right flavors partying in your mouth. And this hasselback apples recipe is super simple too so boyfriends/husbands/friends – get involved – no excuses with this one. And since we’re talking V day (is it seriously February already? I’m stilling writing down my New Years resolutions) Nektar Natural has another treat in store for you. Ok remember middle school (or was it elementary?) when you walked around handing out valentine’s day notes and candies? Well they’re back. You’ve seriously got to check out the Nektar Naturals Valentine’s Day Honey-Gram. This is how it works: you just fill out the form and for free you can send a special someone a personalized love note with a packet of Nektar Honey Crystals. Well what are you waiting for? Fill the form out, send away and get in the kitchen to make these delicious and wintery healthy baked apples recipe for hasselback apples! Make thin slices in the apple halves, being careful not to slice all the way down. In a food processor pulse together walnuts, honey, oats and cinnamon, until broken up into smaller pieces but not completely smooth. Transfer to a bowl. Combine walnut oat mixture with coconut oil. Mixing until incorporated. 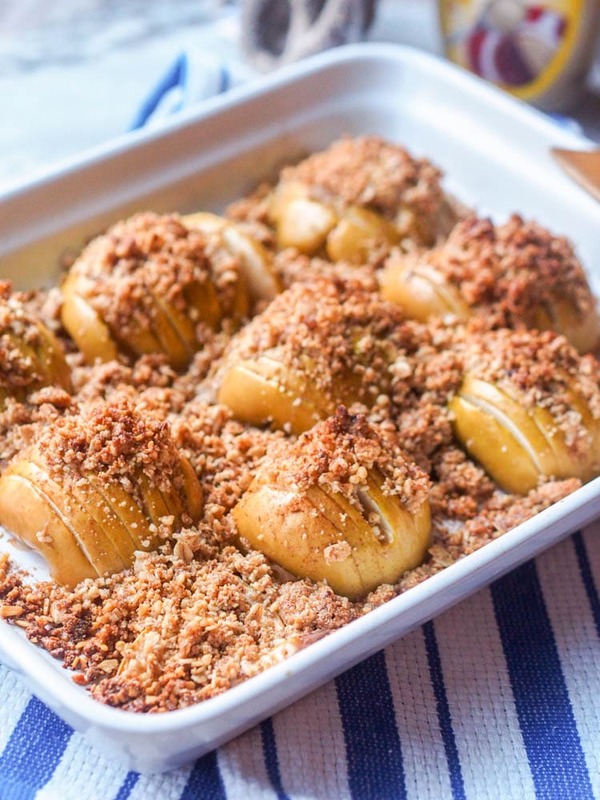 In a baking dish, place apples, cut side down and stuff walnut oat mixture in between the slices and top the apples and surrounding ares with the crumb mixture. Bake for 20-25 minutes, or until apples are soft and crumb mixture has browned. Serve as is or with coconut whipped cream. Thanks! Not only potatoes can rock this cooking style! This is so fun Vicky!!! 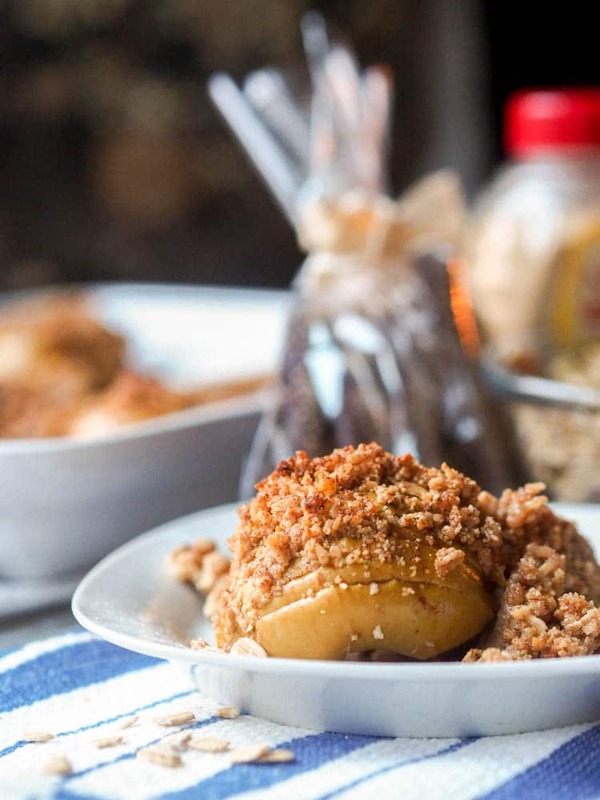 Like a fruit crumble made totally modern! I love hassleback potatoes…so doing an apple version is awesome. Looks delicious. If you love the potatoes made hasselback you’re bound to love the apples cooked this way! What a brilliant idea! Love this and the fact that it’s not filled with lots of sugar and processed ingredients! Perfect comfort food. Thanks! Yes I’m always trying to make sweet treats with minimal processed sugar so this definitely fits in that category! Ok, seriously soooo cute! And a plus, I love baked apples so much. Thanks! Me too – love baked apples, but wanted to put a different spin on them! Ok, this is just such a cool idea! I’ve heard of hasselback potatoes, of course, but never apples. Brilliant! What a fun recipe, and really easy and healthy, too! I just love it! Thanks! I figured if potatoes can pull it off why not apples?! LOVE these!! They look so amazingly good! Those apples just look so tender and perfect!